Stories Celebrating 2017 Arts In Education Week - Land O' Lakes Area Artisans, Inc.
“I grew up in Texas in the 50’s. By the time I was in the 6th grade I was reading on 2nd grade level & still couldn’t keep the alphabet straight in my head. I was labeled a non-learner & just passed from grade to grade. My older brother was a straight A student & my younger brother was reading well beyond me. My parents had no idea what to do with me & just thought & told me I was stupid. My career choices in life were zilch. I went to summer school every summer just to get through high school. My mother read me most of my history, science & English studies. Writing reports was pointless & math was a disaster. I spent a great deal of time looking at pictures in books & magazines. Somehow I began drawing then painting but had no idea why or what for. I just enjoyed it. I went to college with the understanding according to my father it was a waste of time & money. He was right after one semester I was out. It 1964 the military draft was looking for boys like me. It was the 1st week of January & I was one A in the draft. My fathers thought was I should join the service. I took one art class in college & made my first ever A. When I left., my art instructor told me about a new art school that I should apply to. So on a Monday I mailed my work & letter to the school & on Friday I got a telegram saying if I could be there on Monday to start the 2nd semester I’d have a full scholarship. Saturday night I was on a bus going north. Story #2 – RN and Arts Volunteer Laurie Tellier. 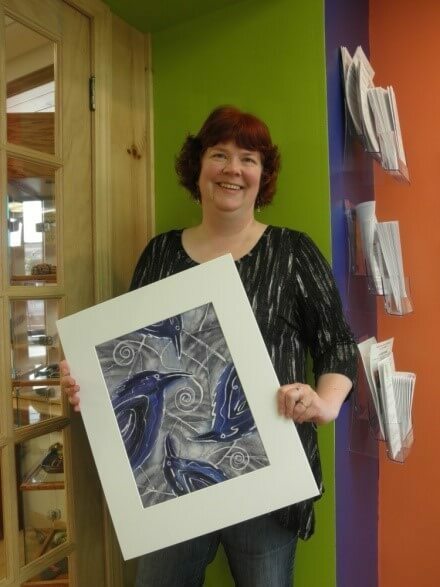 RN and Arts Volunteer Laurie Tellier displaying her artwork from LOLA’s Faux Batik class. Story #3 – Artist and Return LOLA Teacher, Jane Barnard. Jane Barnard teaching 4 Seasons of Watercolor at LOLA. Story #4 – Artist and Former LOLA Art Intern, Nina Fiorucci. Nina helping a LOLA student during Nina’s Quirky Birds Art with Recycled Materials class. Story #5 – Artist and Friend of LOLA, and Watercolor Wednesday Regular, Helen Hayhurst. the water makes. When I get in the ‘creative zone’ my mind is free to wander away from the daily lists and chores! LOLA =Laugh Out Loud with Artists! Story #6 – Artist, Teacher, and LOLA Programming Director, Wendy Powalisz. Wendy displaying some of her artwork. Story # 7 – Writer, Photographer & LOLA Marketing Specialist, Adrienne Jaeger. Adrienne guiding Land O’ Lakes Elementary students as they create art inspired by poetry. “It’s hard for me to identify one moment to encompass why my arts education is so important to me. What I continue to come back to are the many excellent educators and mentors I was so fortunate to have. In high school, my English teacher Peggy Bolle identified my ability as a writer and held me to a high standard, beyond what was required for my general studies. She encouraging me to submit my work, go beyond the required reading curriculum, and really engage with my education to develop my writing ability. She gave me James Joyce’s ‘Portrait of the Artist as a Young Man’ to read, introduced me to one of my favorite authors and opened my eyes to a whole new world of literature. The more voraciously I read and wrote, the more my teenage fantasy of studying theater in New York began to morph into an insatiable desire to be a writer. I ended up going to St. Norbert, a liberal arts college, to major in English with an emphasis in creative writing. My poetry professor Laurie MacDiarmid taught me the importance of revision of my work. I was incredibly stubborn at first, unwilling to seriously reexamine my writing or be open to revision and feedback. Laurie was so patient with me and did not give up, believing in me, knowing that in order to improve, to be the best writer I could be I HAD to be able to receive feedback and revise my work. Yet, she also taught me that I also need to be willing to fight for my work, that if I felt strongly about keeping a line in a poem the way it was, that it was ok. It was MY work and my responsibility to fight for it. I don’t think I truly let go of my own ego enough to receive these lessons until about my Junior year. What Laurie taught me has been part of the strong foundation that has supported me as I continue to grow as a writer. Professor John Neary’s enthusiasm and passion for literature was contagious. My senior year he taught a course focused entirely on Joyce’s ‘Ulysses’. It remains to this day one of the most fascinating, challenging, and inspirational courses of my educational career.